Another Motion Picture Herald entry, this one showing us a cross-section of the cast and crew of Mascot’s The Galloping Ghost. 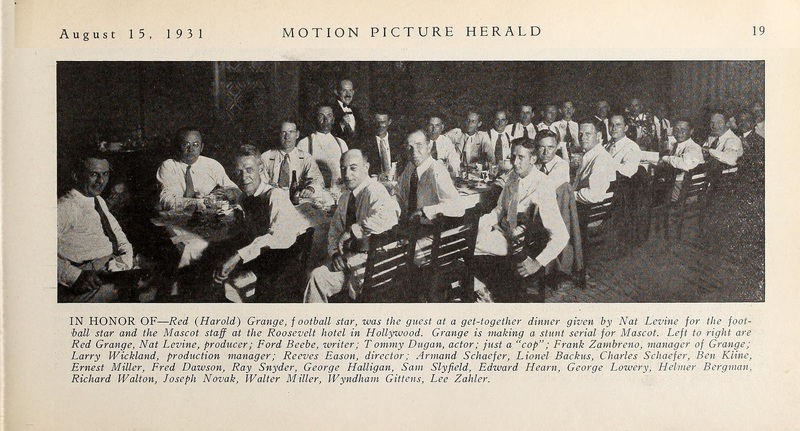 The captioning makes it a little difficult to pin all the names to the faces, but it’s clear that the man sitting third from left is Mascot and Universal serial writer/director Ford Beebe. Mascot boss Nat Levine is second from left. Directors B. Reeves Eason and Armand Schaefer and cinematographers Ben Kline and Ernest Miller can also be picked out with care. Screenwriter Wyndham Gittens is unfortunately a little hard to make out, but he’s sitting behind Walter Miller towards the far right of the picture, with composer Lee Zahler even murkier behind him. Click to enlarge. This entry was tagged Mascot serials, Serial scrapbook, serial-makers. Bookmark the permalink. My father Gene Rizzi knew Ford Beebe well. He always had great things to say about him.